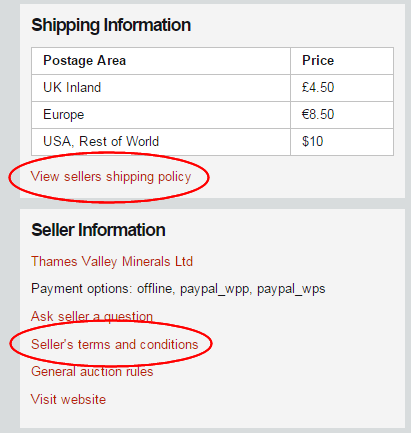 These are the default site Terms and Conditions for Sellers on e-Rocks, including shipping policy. Sellers may have their own specific version for these, these will be published and available via the links in the items listed - see below. Please also refer to the e-Rocks general site Terms & Conditions for overall guidance about the site. 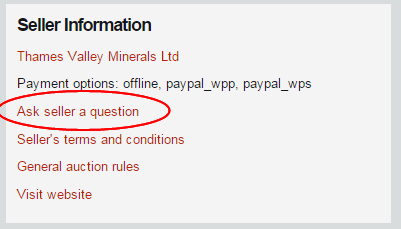 If the Seller has not added their own, the text below will be shown within the item links. Once despatched scheduled delivery time will vary, but delivery should be 1-3 days within the same country, and 5-10 working days Airmail. We will combine orders to reduce overall shipping cost.